Når dit skib trækker i havn, få en omfattende sightseeingtur i Dunedin på Otago-halvøen, herunder Larnach Castle og Cadbury's Chocolate Factory. Port afhentning og drop-off er inkluderet. Din udflugt starter med praktisk afhentning på Port Chalmers kl. 9:30. Leder til Cadbury's Chocolate Factory, hvor du kan tjekke Cadbury's World Experience, en 1-timers tur, der viser dig, hvordan chokolade er lavet og en flydende chokoladeprovning. Du kan også smelke masser af prøver og se, hvordan chokoladehærdning er færdig. Afgang til Larnach Castle, der rejser gennem det naturskønne landskab på Otago-halvøen. Når du er der, tage en rundvisning i landets eneste slot, bygget i slutningen af det 19. århundrede. Gå gennem slottet frodige haver og lær om slottets mørke historie, inden du stopper på stedet restaurant til frokost (egen regning). Tilbage på bussen, rejse gennem Otago-halvøen til Dunedin for en bytur. Du vil se verdens stejleste gade, historiske bygninger, imponerende katedraler og Otago University. Afrejse Dunedin til transport direkte tilbage til krydstogtsporten. Worry-free Shore Excursion: Vi vil sikre din rettidige tilbagevenden til Port Chalmers for denne aktivitet. I det sjældne tilfælde har dit skib afgået, vil vi sørge for transport til den næste port-of-call. Hvis dit skib er forsinket, og du ikke kan deltage i denne aktivitet, bliver dine penge refunderet. Se vores vilkår og betingelser for alle detaljer. Brilliant coach driver/tour guide. A good mix of attractions and sightseeing. Had to do it. When a tour includes chocolate and the only castle in New Zealand how can you turn it down? We were taken on a factory tour of the Cadbury factory in 2016 sadly i think the Cadbury factory is closed now. The guide, who worked there, was so proud of her factory and the amount of high quality candy they produced. The tour ended of course in the gift shop and we had to buy some to get our energy up to tour the castle! It was cute and a great building. Most of the rooms they let you into and the furniture is all there with artifacts from the family. Well worth a day our of our lives! We loved both stops. Spend some time on the grounds of the castle as well, fantastic! We wish the guided tour around the castle could have been shorter to enable us to explore the gardens some more. The scaffoldings on the train station pevented us from taking a more beautiful picture of the building. Our guide Russell has been very helpul and informative. Fantastic tour!! I highly recommend it. The castle tour was great. The chocolate factory tour ok, however we didn't get to see any of the processing lines.The tour guide was excellent! Beautiful country side. A terrible raining day but visiting the castle in that weather was still good, loved going to the chocolate Factory , it is a shame that it is closing down and 700 people are losing their jobs. First, THIS TOUR IS NOT HANDICAPP FRIENDLY. 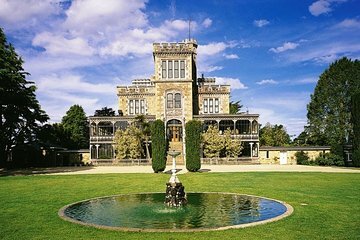 The description of the tour provides information about the steps at Cadbury's Chocolate Factory however, it DOES NOT tell you that Larnach Castle is also not accessible for Handicap individuals. Also, advance notice was given to the tour company about a handicap individual and their collapsible wheelchair. THERE WAS NO CONSIDERATION GIVEN TO THIS INDIVIDUAL ON THE BUS. My 81 year old handicapped grandmother had to WALK all the way to the back of the bus usually there are reserved seats in the front. Aside from the lack of handicap consideration, the tour was just OK. Larnach Castle is nice, but not WOW worthy. The highlight is the Cadbury's Chocolate Factory where you get samples along the tour. Also, sightseeing included Baldwin Street some steep street - lame and the train station nice architecture there. Overall, the tour was just average. Josh was a great tour guide. More time required qt the castle.